We are sorry to say goodbye to Napier. Here we could have rested longer, enjoyed the easy lifestyle and, no doubt, tasted more wines, but we have a schedule to keep to and since we have booked and paid for our accommodation en-route, then en-route we must be. We arise early, load our chattels into our trusty car and head south. The journey is easy, but long and David tries to maintain a steady 100 kph (the national speed limit), overtaking any vehicle that is going more slowly. This necessitates some careful reading of the road markings, some adroit use of passing places and a few bursts of speed that can only be described as exuberant. 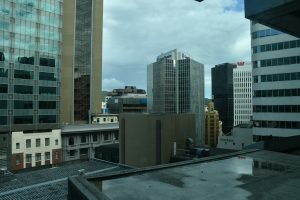 Six hours of travel finds us entering Wellington in light drizzle where we find or hotel, recce the journey to the ferry terminal unload our various boxes and bags (for the car has become a kind of home from home) and repack it in an orderly manner in its two suitcases. Here we must drop off our hire car, take the ferry to South Island as foot-passengers and pick up a new hire car in Picton. Sounds complicated but it makes good economic sense. Wellington is the capital city of New Zealand. I guess it being situated more or less half way between the two islands’ extremities that is good politics. I mentioned that the developers of Auckland had not been kind to its inhabitants. The developers of Wellington have been, in comparison, positively cruel. Modernist commercial tower blocks labelled at their tops “Deloites” and “Bank of New Zealand” in bright lights (such vanity) blight this coastal port town and dwarf the remaining Victorian dwellings and its quite grand municipal palaces. Such a shame. We venture out in search of sustenance and after an exhausting trek – for Wellington is hilly, rather like San Franisco – we end up in the dock-side sheds, now revamped as chi-chi restaurants with loud music and brash waitresses. With our Mission Estate bon-viveur evening fresh in mind we endure a dreary and dispiriting repast. We shall not be sorry to leave Wellington. 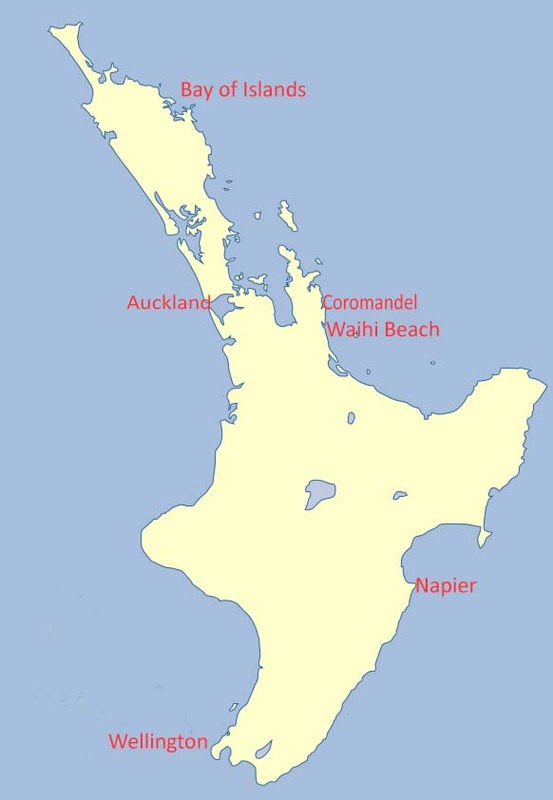 This entry was posted in New Zealand 2018 on 22 February, 2018 by David. Glad you had a good time in Napier. We liked it and could have stayed there longer and visited more wineries. 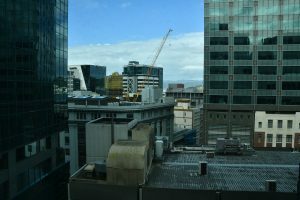 We had a few days in Wellington with my cousins who showed us around. It’s a shame that you didn’t see the best of Wellington. There is a lot more to it. You will enjoy South Island.